Raj blames ''migrants'' for outbreak of malaria in Mumbai! Aligarh: The Vice Chancellor of Aligarh Muslim University, Prof. P. K. Abdul Azis on Sunday said that the University has made significant advancement to improve the quality of teaching and research and expansion of the University by establishing two AMU centres, one at Malappuram in Kerala and the other at Murshidabad in West Bengal. 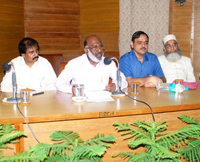 Addressing a Media Conference Prof. Azis said that the idea of AMU Centres in Muslim concentrated regions has captured the minds of the people and the Government of India has decided to unlock the potential of AMU for the educational uplift of the people inhabited in distant regions. Prof. Azis said that the University Court in its special meeting on July 31 overwhelmingly supported the initiative of establishing AMU Centres and almost unanimously approved the amendments passed by the Academic Council and the Executive Council and stated that now legal track is clear and all the roadblock is removed to further carry forward the process of establishing new AMU Centres. Regarding the PIL and the Court meeting the Vice Chancellor said that the court has clarified that “no clarification is required as the subject matter pertains to subordinate legislation” and the University Counsel’s clarification that ‘in view of the above the University might proceed with Court Meeting for the legislative business on July 31, 2010 in respect of the amendments /legislation in the Statutes as per its agenda’. To set at rest the confusion and doubts expressed by a small group, Prof. Azis said that once the President of the country as Visitor of the University has approved the centres, there cannot exist any legal infirmities as the Visitor approves the proposals only after due scrutiny and wetting from expert officials and legal entities. He was categorical in clarifying that the establishment of new centres is a University agenda approved by the statutory bodies of the University. He observed that the admission policy of these centres when commenced would be the same and the University will conduct the admission test for MBA and BALLB at Aligarh, Calicut and Kolkata.